This snowmobile stay is characterized by its attractive price, its flexibility and accessibility to everyone. Its steps can be day-to-day customized to your wishes and needs ! 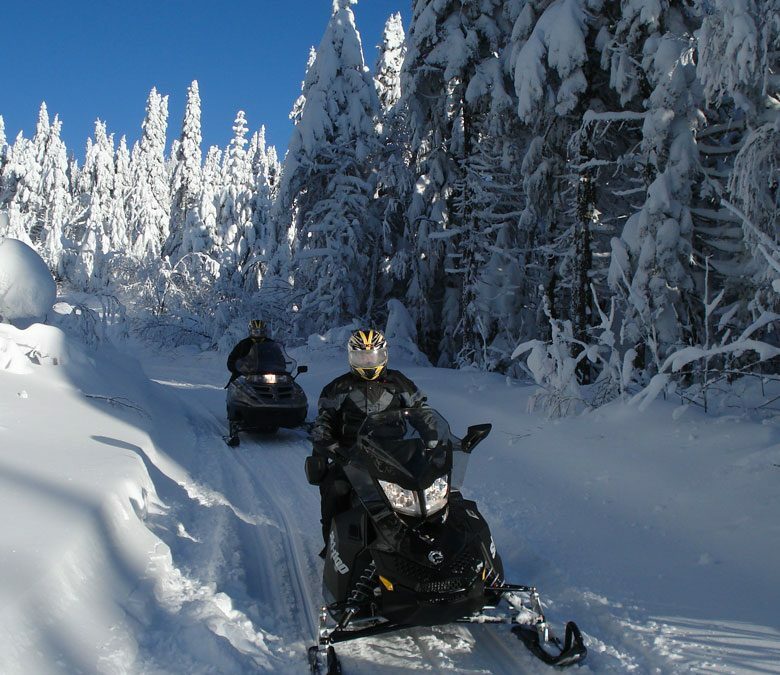 On your snowmobile, discover the most beautiful Laurentides’ and Lanaudière’s winter landscapes. Golden Gate Bridge and Montagne Noire are the strong points of this ride, but the Ouareau shelter’s panorama, the crossing of the Lac des Îles, the suspension bridge and also the ride around Georges Lake on your snowmobile will leave you with lasting memories. Each night you will come back to the chalet to spend a warm evening smelling the wood fire in the fire place and a have a comfort dinner. You will also discover the wonders of nature with the dog sledding experience. Of course, you will have the pleasure to lead your own dogteam upon your guide’s advices. You will discover the Hautes Laurentides. You will cross the Lac des Iles (4km) and the Lac Masson (3km) like you were on a real “ice bridge” ! Your trip will all be on icy lakes and snowy forests, open your eyes : maybe you will be lucky and see a deer, a fox or a hazel grouse. Each ride will be greated with numerous photo stops. Dinner and overnight at the inn. After you had a hearty breakfast your guide will have you discover the village of St Côme. In winter, this charming little village of the Lanaudière region hosts an ice sculpture competition. If your reservation with us is during this competition time, you could enjoy seeing the artists working. Dinner and overnight at the inn. It is a lovely inn composed of bedrooms with double bed and private or shared bathroom. You could relax in front of a fireplace in the living room.